In accordance with Article 2(e) and Annex II to Directive 2008/57/EC, the rail system is subdivided into structural and functional subsystems, including an energy subsystem. By Decision C(2006) 124 final of 9 February 2006, the Commission gave a mandate to the European Railway Agency (the Agency) to develop technical specifications for interoperability (TSIs) under Directive 2001/16/EC of the European Parliament and of the Council of 19 March 2001 on the interoperability of the trans-European conventional rail system (2). Under the terms of that mandate, the Agency was requested to draw up the draft TSI related to the energy subsystem of the conventional rail system. Technical specifications for interoperability (TSI) are specifications adopted in accordance with the Directive 2008/57/EC. The TSI in Annex covers the energy subsystem in order to meet the essential requirements and ensure the interoperability of the rail system. The TSI in Annex should refer to Commission Decision 2010/713/EU of 9 November 2010 on modules for the procedures for assessment of conformity, suitability for use and EC verification to be used in the technical specifications for interoperability adopted under Directive 2008/57/EC of the European Parliament and of the Council (3). In accordance with Article 17(3) of Directive 2008/57/EC, Member States are to notify to the Commission and other Member States the conformity assessment and verification procedures to be used for the specific cases, as well as the bodies responsible for carrying out these procedures. The TSI in Annex should be without prejudice to the provisions of other relevant TSIs which may be applicable to energy subsystems. The TSI in Annex should not impose the use of specific technologies or technical solutions except where this is strictly necessary for the interoperability of the rail system within the Union. In accordance with Article 11(5) of Directive 2008/57/EC, the TSI in Annex should allow, for a limited period of time, for interoperability constituents to be incorporated into subsystems without certification if certain conditions are met. To continue to encourage innovation and to take into account the experience acquired, the TSI in Annex should be subject to periodic revision. A Technical Specification for Interoperability (TSI) relating to the energy subsystem of the trans-European conventional railway, is hereby adopted by the Commission. The TSI shall be as set out in the Annex to this Decision. This TSI shall be applicable to all new, upgraded or renewed infrastructure of the trans-European conventional rail system as defined in Annex I to Directive 2008/57/EC. The procedures for assessment of conformity, suitability for use and EC verification set out in Chapter 6 of the TSI in Annex shall be based on the modules defined in Decision 2010/713/EU. 1. During a transition period of 10 years, it shall be permissible to issue an EC certificate of verification for a subsystem that contains interoperability constituents not holding an EC Declaration of conformity or suitability for use, on the condition that the provisions set out in Section 6.3 of the Annex are met. 2. The production or upgrade/renewal of the subsystem with use of the non-certified interoperability constituents must be completed within the transition period, including the placing in service. the details of the non-certified interoperability constituents and the reasons for non-certification, including the application of national rules notified under Article 17 of Directive 2008/57/EC, are included by the National Safety Authorities in their annual report referred to in Article 18 of Directive 2004/49/EC of the European Parliament and of the Council (4). 4. After the transition period and with the exceptions allowed under Section 6.3.3 on maintenance, interoperability constituents shall be covered by the required EC declaration of conformity and/or suitability for use before being incorporated into the subsystem. In accordance with Article 5(3)(f) of Directive 2008/57/EC, the TSI in Annex, Chapter 7, sets out a strategy for migrating towards a full interoperable energy subsystem. This migration needs to be applied in conjunction with Article 20 of that Directive which specifies the principles of the application of the TSI to the renewal and upgrading projects. Member States shall notify to the Commission a report on the implementation of Article 20 of Directive 2008/57/EC 3 years after the entry into force of this Decision. This report will be discussed in the context of the Committee set up in Article 29 of Directive 2008/57/EC and, where appropriate, the TSI in Annex will be adapted. 1. With regard to those issues classified as specific cases set out in Chapter 7 of the TSI, the conditions to be complied with for the verification of the interoperability pursuant to Article 17(2) of Directive 2008/57/EC shall be those applicable technical rules in use in the Member State which authorise the placing in service of the subsystems covered by this Decision. the bodies it appoints for carrying out the conformity assessment and checking procedures of the specific cases mentioned in paragraph 1. This Decision shall apply from 1 June 2011. Done at Brussels, 26 April 2011. (2) OJ L 110, 20.4.2001, p. 1. (4) OJ L 164, 30.4.2004, p. 44. This TSI concerns the energy subsystem of the trans-European conventional rail system. The energy subsystem is included in the list of subsystems in Annex II to the Directive 2008/57/EC. The geographical scope of this TSI is the trans-European conventional rail system as described in Annex I Chapter 1.1 to the Directive 2008/57/EC. indicates, for the staff concerned, the professional qualifications and health and safety conditions at work required for the operation and maintenance of the subsystem concerned, as well as for the implementation of the TSI — Chapter 4. Moreover, in accordance with Article 5(5), provision may be made for specific cases; these are indicated in Chapter 7. Lastly, this TSI also comprises, in Chapter 4, the operating and maintenance rules specific to the scope indicated in paragraphs 1.1 and 1.2 above. The Energy TSI specifies those requirements which are necessary to assure the interoperability of the rail system. This TSI covers all fixed installations, DC or AC that are required to supply, with respect to the essential requirements, traction energy to a train. The energy subsystem also includes the definition and quality criteria for interaction between a pantograph and the overhead contact line. As the ground level conductor rail (third rail) and contact shoe system is not a ‘target’ system, this TSI does not describe the characteristics or functionality of such a system. (e) return circuit: all conductors which form the intended path for the traction return current and which are additionally used under fault conditions. Therefore, so far as this aspect is concerned, the return circuit is part of the energy subsystem and has an interface with the infrastructure subsystem. (f) on-board parts of the electric consumption measuring equipment— for measurement of electric energy taken from or returned to (during regenerative braking) the contact line by the vehicle, supplied from the external electric traction system. The equipment is integrated into and put into service with the traction unit, and is in the scope of the conventional rail locomotives and passenger rolling stock TSI (CR LOC&PAS). The Directive 2008/57/EC also foresees that the current collectors (pantographs), which transmit electrical energy from the overhead contact line system to the vehicle, are in the rolling stock subsystem. They are installed and are integrated into and put into service with the rolling stock and are in the scope of CR LOC&PAS TSI. However, the parameters relating to the quality of current collection are specified in CR ENE TSI. The power supply system has to be designed such that every train will be supplied with the necessary power. Therefore, the supply voltage, current draw of each train and the operating schedule are important aspects for performance. As with any electrical device, a train is designed to operate correctly with a nominal voltage and a nominal frequency applied at its terminals, i.e. the pantograph(s) and wheels. Variations and limits of these parameters need to be defined in order to assure the anticipated train performance. Modern, electrically powered trains are often capable of using regenerative braking to return energy to the power supply, reducing power consumption overall. The power supply system can be designed to accommodate such regenerative braking energy. In any power supply, short-circuits and other fault conditions may occur. The power supply needs to be designed so that the controls detect these faults immediately and trigger measures to remove the short-circuit current and isolate the affected part of the circuit. After such events, the power supply has to be able to restore supply to all installations as soon as possible in order to resume operations. A compatible geometry of the overhead contact line to the pantograph is an important aspect of interoperability. As far as geometrical interaction is concerned, the height of the contact wire above the rails, the variation in contact wire height, the lateral deviation under wind pressure and the contact force have to be specified. The geometry of the pantograph head is also fundamental to assure good interaction with the overhead contact line, taking into account vehicle sway. In order to support interoperability of European networks, the pantographs specified in CR LOC&PAS TSI are the target. the number of pantographs in service and the distance between them, since each pantograph can interfere with the others on the same overhead contact line section. Voltage and frequency and their permissible ranges interface with the rolling stock subsystem. The power installed on the lines and the specified power factor determines the performance of the rail system and interfaces with the rolling stock subsystem. 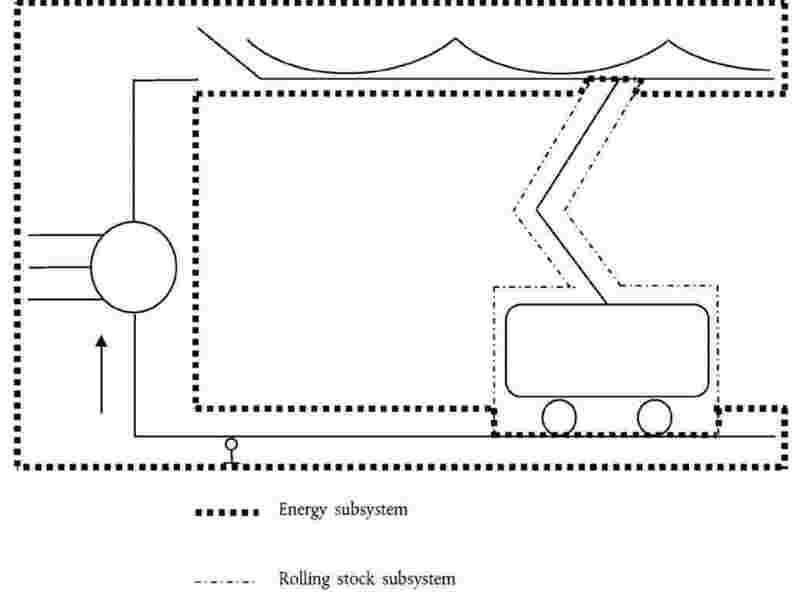 Regenerative braking reduces energy consumption and interfaces with the rolling stock subsystem. Electrical fixed installations and on-board traction equipment need to be protected against short circuits. Circuit breaker tripping in substations and on trains has to be coordinated. Electrical protection interfaces with the rolling stock subsystem. Electrical interference and harmonic emissions interface with the rolling stock and control-command and signalling subsystems. The current return circuit has some interfaces with control-command and signalling and infrastructure subsystems. The contact wire gradient and rate of change of gradient needs special attention in order to avoid loss of contact and excessive wear. The contact wire height and gradient interfaces with the infrastructure and rolling stock subsystems. Vehicle and pantograph sway interfaces with the infrastructure subsystem. The quality of current collection depends on the number of pantographs in service, their spacing and other traction-unit-specific details. The arrangement of pantographs interfaces with the rolling stock subsystem. To pass transitions between different power supply system and phase separation sections, without bridging, the number and arrangement of pantographs on trains shall be stipulated. This interfaces with the rolling stock subsystem. To pass transitions of power supply system and phase separation sections, without bridging, control of train current is required. This interfaces with the control-command and signalling subsystem. When passing through power supply system separation sections, lowering of pantograph(s) may be required. This interfaces with the control-command and signalling subsystem. According to Article 4(1) of the Directive 2008/57/EC, the rail system, its subsystems and their interoperability constituents shall fulfil the essential requirements set out in general terms in Annex III to the Directive. The following table indicates basic parameters of this TSI and their correspondence to the essential requirements as explained in Annex III to the Directive. The rail system, to which the Directive 2008/57/EC applies, and of which the subsystem is a part, is an integrated system whose consistency shall be verified. This consistency must be checked, in particular, with regard to the specifications of the subsystem, its interfaces vis-à-vis the system in which it is integrated, as well as the operating and maintenance rules. The functional and technical specifications of the subsystem and its interfaces, described in chapters 4.2 and 4.3, do not impose the use of specific technologies or technical solutions, except where this is strictly necessary for the interoperability of the rail network. But innovative solutions for interoperability may require new specifications and/or new assessment methods. In order to allow technological innovation, these specifications and assessment methods shall be developed by the process described in chapters 6.1.3 and 6.2.3. Taking account of all the applicable essential requirements, the energy subsystem is characterised by the specifications set out in clauses 4.2 to 4.7. A list of parameters relevant for the energy subsystem which shall be collected in the Register of infrastructure is in Annex C to this TSI. Procedures for the EC verification of the energy subsystem are indicated in clause 6.2.4 and Annex B, Table B.1, to this TSI. Where reference is made to EN standards, any variations called ‘national deviations’ or ‘special national conditions’ in the EN do not apply. the power demand of the trains at the pantographs. electric energy consumption measuring equipment (4.2.21). Locomotives and traction units need standardisation of voltage and frequency. The values and limits of the voltage and frequency at the terminals of the substation and at the pantograph shall comply with EN50163:2004, clause 4. The AC 25 kV 50 Hz system is to be the target supply system, for reasons of compatibility with the electrical generation and distribution systems and standardisation of substation equipment. Nominal voltage and frequency shall be listed in the Register of infrastructure (see Annex C). The design of the energy subsystem is determined by the line speed for the planned services and the topography. The Infrastructure Manager shall declare the maximum train current in the Register of infrastructure (see Annex C). The energy subsystem design shall ensure the ability of the power supply to achieve the specified performance and permit the operation of trains with a power less than 2 MW without current limitation as described in clause 7.3 of EN50388:2005. The power factor of trains shall be in accordance with requirements in Annex G and EN50388:2005 clause 6.3. The calculated mean useful voltage ‘at the pantograph’ shall comply with EN50388:2005, clauses 8.3 and 8.4, using the design data for the power factor according to Annex G.
The power supply and the overhead contact line system shall be designed to enable continuity of operation in case of disturbances in tunnels. This shall be achieved by sectioning overhead contact line in accordance with clause 4.2.3.1 of the SRT TSI. The overhead contact line of DC systems shall be designed to sustain 300 A (for a 1.5 kV supply system) and 200 A (for a 3 kV supply system), per pantograph when the train is at standstill. This shall be achieved using a static contact force as defined in clause 7.1 of EN50367:2006. Where the overhead contact line has been designed to sustain higher values for maximum current at standstill, this shall be declared by the Infrastructure Manager in the Register of infrastructure (see Annex C). The OCL shall be designed taking into account the temperature limits in accordance with EN50119:2009 clause 5.1.2. AC power supply systems shall be designed to permit the use of regenerative braking as a service brake, able to exchange power seamlessly either with other trains or by any other means. DC power supply systems shall be designed to permit the use of regenerative braking as a service brake at least by exchanging power with other trains. Information about possibility of the use of regenerative braking shall be provided in the Register of infrastructure (see Annex C). Electrical protection coordination design of the energy subsystem shall comply with the requirements detailed in EN50388:2005, clause 11 except Table 8 which is replaced by Annex H to this TSI. The CR energy subsystem and rolling stock must be able to work together without interference problems, such as over-voltages and other phenomena described in EN50388:2005 clause 10. Harmonic emissions towards the power utility shall be dealt with by the Infrastructure Manager taking into account European or national standards and the requirements of the power utility. No conformity assessment is required within this TSI. External electromagnetic compatibility is not a specific characteristic of the rail network. Energy supply installations shall comply with the Essential Requirements of the EMC Directive 2004/108/EC. Protection of the environment is covered by other European legislation concerning the assessment of the effects of certain projects on the environment. Overhead contact line shall be designed for use by pantographs with the head geometry specified in the CR LOC&PAS TSI clause 4.2.8.2.9.2. The contact wire height, gradient of the contact wire in relation to the track and the lateral deviation of the contact wire under the action of a cross-wind all govern the interoperability of the rail network. The nominal contact wire height shall be in the range of 5,00 – 5,75 m. For the relation between the contact wire heights and pantograph working heights see EN50119:2009 figure 1. The contact wire height may be lower in cases related to gauge (like bridges, tunnels). The minimum contact wire height shall be calculated in accordance with EN50119:2009 clause 5.10.4. The contact wire may be higher in cases e.g. level crossings, loading areas, etc. 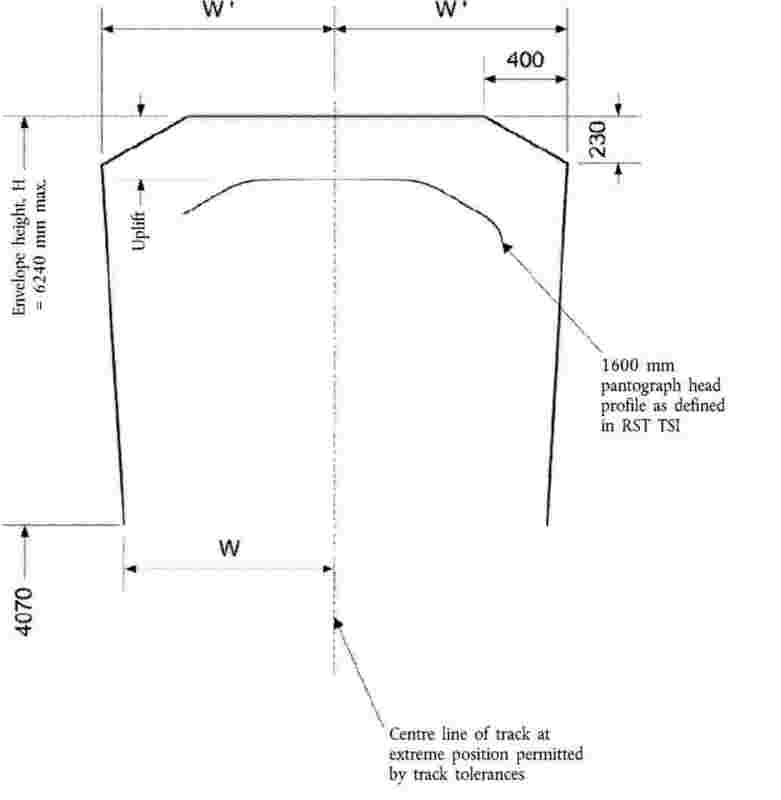 In these cases the maximum design contact wire height shall not be greater than 6,20 m.
Taking into account tolerances and uplift in accordance with EN50119:2009 figure 1, the maximum contact wire height shall not be greater than 6,50 m.
The nominal contact wire height shall be listed in the Register of infrastructure (see Annex C). The variation in contact wire height shall fulfil the requirements imposed by EN50119:2009 clause 5.10.3. The contact wire gradient specified in EN50119:2009 clause 5.10.3 may be exceeded on an exceptional basis where a series of restrictions on the contact wire height e.g. level crossings, bridges, tunnels, prevents compliance; in this case when applying the requirements of clause 4.2.16, only the requirement related to the maximum contact force shall be complied with. 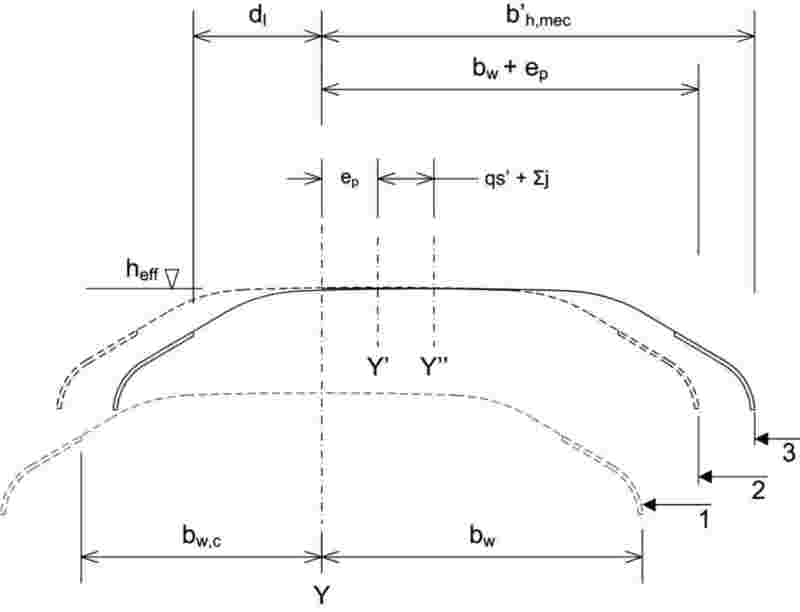 The maximum permissible lateral deviation of the contact wire normal to the design track centre line under the action of cross wind is given in Table 4.2.13.3. The values shall be adjusted taking into account the movement of the pantograph and track tolerances according to Annex E.
In the case of the multi-rail track, the requirement shall be fulfilled for each pair of rails (designed, to be operated as separated track) that is intended to be assessed against TSI. The pantograph profiles that are permitted to operate on the route, shall be listed in the Register of infrastructure (see Annex C). No part of the energy subsystem shall enter the mechanical kinematic pantograph gauge (see Annex E figure E.2) except for the contact wire and steady arm. The mechanical kinematic pantograph gauge for interoperable lines is determined using the method shown in Annex E clause E.2 and the pantograph profiles defined in CR LOC&PAS TSI clause 4.2.8.2.9.2.
in accordance with Annex E clause E.2.1.4 and other values in accordance with Annex E clause E.3. The mean contact force Fm is the statistical mean value of the contact force. Fm is formed by the static, dynamic and aerodynamic components of the pantograph contact force. The static contact force is defined in EN50367:2006 clause 7.1. The ranges of Fm for each of the power supply systems are defined in Table 4.2.15.
where [Fm] = mean contact force in N and [v] = speed in km/h. In accordance to clause 4.2.16, overhead contact lines shall be designed to be capable to sustain this upper limit force curve given in Table 4.2.15. The overhead contact line shall be designed in accordance with the requirements for dynamic behaviour. Contact wire uplift at the design speed shall comply with the stipulations in Table 4.2.16. The quality of current collection has a fundamental impact on the life of a contact wire and shall, therefore, comply with agreed and measurable parameters. The Contracting Entity shall declare the method to be used for verification. The values to be achieved by the chosen method are set out in Table 4.2.16. For definitions, values and test methods refer to EN50317:2002 and EN50318:2002. S0 is the calculated, simulated or measured uplift of the contact wire at a steady arm, generated in normal operating conditions with one or more pantographs with a mean contact force Fm at the maximum line speed. When the uplift of the steady arm is physically limited due to the overhead contact line design, it is permissible for the necessary space to be reduced to 1,5 S0 (refer to EN50119:2009 clause 5.10.2). Maximum force (Fmax) on an open route is usually within the range of Fm plus three standard deviations σmax; higher values may occur at particular locations and are given in EN50119:2009, Table 4 clause 5.2.5.2. For rigid components such as section insulators in overhead contact line systems, the contact force can increase up to a maximum of 350 N.
the number of pantographs above two, for which the line has been designed. The combination of contact wire material and contact strip material has a strong impact on the wear on both sides. Permissible materials for contact wires are copper and copper-alloy (excluding copper-cadmium-alloys). The contact wire shall comply with the requirements of EN50149:2001 clauses 4.1, 4.2 and 4.5 to 4.7 (excluding Table 1). For AC lines the contact wire shall be designed to permit the use of plain carbon contact strips (CR LOC&PAS TSI clause 4.2.8.2.9.4.2). Where the IM accepts other contact strip material an entry shall be made in the Register of infrastructure (see Annex C). For DC lines the contact wire shall be designed to accept contact strip materials in accordance with CR LOC&PAS TSI clause 4.2.8.2.9.4.2. The design of phase separation sections shall ensure that trains can move from one section to an adjacent one without bridging the two phases. Power consumption shall be brought to zero according to EN50388:2005 clause 5.1. Adequate means (except the short separation section as in Annex F — fig. F.1) shall be provided to allow a train that is stopped within the phase separation section to be restarted. The neutral section shall be connectable to the adjacent sections by remotely controlled disconnectors. The design of separation sections shall normally adopt solutions as described in EN50367:2006 Annex A.1 or in Annex F to this TSI. Where an alternative solution is proposed, it shall be demonstrated that the alternative is at least as reliable. Information on the design of phase separation sections and permissible configuration of raised pantographs shall be provided in the Register of infrastructure (see Annex C). The design of system separation sections shall ensure that vehicles can move from one power supply system to an adjacent different power supply system without bridging the two systems. A system separation between AC and DC system needs additional measures to be taken in the return circuit as defined in EN50122-2:1998, clause 6.1.1.
with pantograph lowered and not touching the contact wire. The neighbouring Infrastructure Managers shall agree either (a) or (b) according to the prevailing circumstances. The method to be adopted shall be recorded in the Register of infrastructure (see Annex C). variation in contact wire height along the entire separation section shall fulfil requirements set in EN50119:2009 clause 5.10.3. The pantograph arrangements that are permitted to traverse the system separation with pantographs raised shall be provided in the Register of infrastructure (see Annex C). This option shall be chosen if the conditions of operation with pantographs raised cannot be met. If a system separation section is traversed with pantographs lowered, it shall be designed so as to avoid the bridging by an unintentionally raised pantograph. Equipment shall be provided to switch off both power supply systems should a pantograph remain raised, e.g. by detection of short circuits. As it is specified in clause 2.1 of this TSI, requirements for the on-board electric energy consumption measuring equipment are set out in the CR LOC&PAS TSI. If an electric energy consumption measuring equipment is installed, it shall be compatible with CR LOC&PAS TSI clause 4.2.8.2.8. This equipment can be used for billing purposes and the data provided by it shall be accepted for billing in all Member States. From the standpoint of technical compatibility, the interfaces are listed in subsystem order as follows: rolling stock, infrastructure, control and command and signalling, traffic operation and management. They also include indications to safety in railway tunnels TSI (SRT TSI). The interface for power control at phase and system separation sections is an interface between the energy and the rolling stock subsystems. However, it is controlled via the control-command and signalling subsystem and consequently the interface is specified in the CR CCS TSI and the CR LOC & PAS TSI. Since the harmonic currents generated by rolling stock affect the control-command and signalling subsystem through the energy subsystem, this subject is dealt within the control-command and signalling subsystem. The Infrastructure Manager is required to have systems in place to communicate with the Railway Undertakings. Under normal conditions in order to conform to clause 4.2.4.1, the maximum permissible train current shall not exceed the value contained in the Register of Infrastructure (see Annex C). Under abnormal conditions the maximum permissible train current (see Annex C) can be lower. The Infrastructure Manager shall give notice of the variation to the Railway Undertakings. Procedures shall be implemented by the Infrastructure Manager to manage the power supply adequately in an emergency. Railway undertakings operating and companies working on the line shall be given notice of the temporary measures, of their geographic location, their nature and the means of signalling. The responsibility for earthing shall be defined in the emergency plan to be written by the Infrastructure Manager. Conformity assessment shall be carried out by checking the existence of communications channels, instructions, procedures and devices to be used in emergency. In certain situations involving pre-planned works, it may be necessary to temporarily suspend the specifications of the energy subsystem and its interoperability constituents defined in chapters 4 and 5 of the TSI. In this case, the Infrastructure Manager shall define the appropriate exceptional operating conditions needed to ensure safety. railway undertakings operating and companies working on the line shall be given notice of these temporary exceptions, of their geographic location, their nature and the means of indication. The specified characteristics of the power supply system (including substations and sectioning locations) and the overhead contact line shall be upheld during their lifetime. A maintenance plan shall be drawn up to ensure that the specified characteristics of the energy subsystem required to assure interoperability are upheld within the specified limits. The maintenance plan shall contain in particular the description of professional competences for the staff and of the personal protective safety equipment to be used by it. Maintenance procedures shall not downgrade safety provisions such as the continuity of return current circuit, limitation of overvoltages and detection of short circuits. The IM is responsible for the professional qualifications and competence of the staff which operates and controls the energy subsystem; the IM has to ensure that the processes for competence assessment are clearly documented. The competence requirements for the maintenance of the energy subsystem shall be detailed in the maintenance plan (see clause 4.5). The health and safety conditions of staff required for the operation and maintenance of the energy subsystem and for the implementation of the TSI, are described in the following clauses. Electrical safety of the traction power supply systems’ shall be achieved by designing and testing these installations according to EN50122-1:1997, clauses 8 (excluding reference to EN50179) and 9.1. Substations and sectioning locations shall be barred against unauthorised access. The earthing of substations and sectioning locations shall be integrated into the general earthing system along the route. For each installation, it shall be demonstrated that return current circuits and earthing conductors are adequate by design review. It shall be demonstrated that the provisions for protection against electric shock and rail potential, as designed, have been installed. Electrical safety of the overhead contact line system and protection against electric shock shall be achieved by compliance with EN50119:2009 clause 4.3 and EN50122-1:1997 clauses 4.1, 4.2, 5.1, 5.2 and 7, excluding requirements for connections for track circuits. The earthing provisions of the overhead contact line system shall be integrated into the general earthing system along the route. For each installation, it shall be demonstrated that earthing conductors are adequate, by design review. It shall be demonstrated that the provisions for protection against electric shock and rail potential, as designed, have been installed. Electrical safety and functionality of the current return circuit shall be achieved by designing these installations according to EN50122-1:1997, clauses 7 and 9.2 to 9.6 (excluding reference to EN 50179). For each installation it shall be demonstrated that return current circuits are adequate by design review. It shall also be demonstrated that the provisions for protection against electric shock and rail potential, as designed, have been installed. In addition to clauses 4.7.2 to 4.7.4, and the requirements specified in the maintenance plan (see clause 4.5), precautions shall be taken to ensure health and safety for maintenance and operations staff, in accordance with the European regulations and the national regulations that are compatible with European legislation. Staff engaged in the maintenance of the energy subsystem, when working on or near the track, shall wear reflective clothes, which bear the CE mark (and therefore satisfy the provisions of Council Directive 89/686/EEC of 21 December 1989 on the approximation of the laws of the Member States relating to personal protective equipment (1). In accordance with Articles 33 and 35 of the Directive 2008/57/EC, each TSI shall indicate precisely the information that must be included in the European register of authorised types of vehicles and Register of Infrastructure. Annex C to this TSI indicates which information concerning the energy subsystem shall be included in the Register of infrastructure. In all cases when any part or whole of an energy subsystem is made compliant with this TSI, an entry shall be made in the Register of Infrastructure as indicated in Annex C and the relevant clause in chapters 4 and 7.5 (specific cases). Annex D to this TSI indicates which information concerning the energy subsystem shall be included in the European register of authorised types of vehicles. The interoperability constituents are covered by the relevant provisions of the Directive 2008/57/EC, and are listed below so far as the energy subsystem is concerned. The Interoperability Constituent overhead contact line consists of the components listed below to be installed within an energy subsystem, and the associated design and configuration rules. The components of an overhead contact line are an arrangement of wire(s) suspended over the railway line for supplying electricity to electric trains, together with associated fittings, in-line insulators and other attachments including feeders and jumpers. It is placed above the upper limit of the vehicle gauge, supplying vehicles with electrical energy through pantographs. The supporting components such as cantilevers, masts and foundations, return conductors, auto-transformer feeders, switches and other insulators are not part of the interoperability constituent overhead contact line. They are covered by subsystem requirements so far as interoperability is concerned. The conformity assessment shall cover the phases and characteristics as indicated in clause 6.1.3 and by X in the Table A.1 of Annex A to this TSI. The design of the overhead contact line shall comply with clause 4.2.13. The overhead contact line shall be designed by using the mean contact force F m stipulated in clause 4.2.15. Requirements for dynamic behaviour of the overhead contact line are set out in clause 4.2.16. The overhead contact line shall be designed providing the required space for uplift as set out in clause 4.2.16. The overhead contact line shall be designed for a pantograph spacing as specified in clauses 4.2.17. For DC systems, the overhead contact line shall be designed for the requirements set out in clause 4.2.6. The contact wire material shall comply with the requirements set out in clause 4.2.18. The conformity assessment procedures of interoperability constituents as defined in Chapter 5 of this TSI shall be carried out by application of relevant modules. Assessment procedures for particular requirements for interoperability constituent are set out in clause 6.1.4. The modules for conformity assessment of interoperability constituents shall be chosen from those shown in Table 6.1.2. In the case of products placed on the market before the publication of this TSI, the type is considered to have been approved and therefore EC type examination (module CB) is not necessary, provided that the manufacturer demonstrates that tests and verification of interoperability constituents have been considered successful for previous applications under comparable conditions and are in conformity with the requirements of this TSI. In this case these assessments shall remain valid in the new application. If it is not possible to demonstrate that the solution is positively proven in the past, the procedure for ICs placed on the EU market after publication of this TSI applies. If an innovative solution is proposed for an interoperability constituent as defined in clause 5.2, the manufacturer or his authorised representative established within the Community shall state the deviations from the relevant clause of this TSI and submit them to the Commission for analysis. In case the analysis results in a favourable opinion, the appropriate functional and interface specifications for the constituent and the assessment method will be developed under the authorisation of the Commission. By the notification of a decision of the Commission, taken in accordance with Article 29 of the Directive, the innovative solution may be permitted to be used before being incorporated into the TSI by the revision process. The assessment of the dynamic behaviour and the quality of the current collection involves the overhead contact line (energy subsystem) and the pantograph (rolling stock subsystem). A new design of overhead contact line shall be assessed by simulation according to EN50318:2002 and by measurement of a test section of the new design according to EN50317:2002. For the purposes of simulation and analysis of the results, representative features (for example tunnels, crossovers, neutral sections etc.) shall be taken into account. The simulations shall be made using at least two different TSI compliant (2) types of pantograph for the appropriate speed (3) and supply system, up to the design speed of the proposed Interoperability Constituent overhead contact line. It is permitted to perform the simulation using types of pantograph that are under the process of IC certification, provided that they fulfil the other requirements of CR LOC&PAS TSI. The simulation shall be performed for single pantograph and multiple pantographs with spacing according to the requirements set in clause 4.2.17. In order to be acceptable, the simulated current collection quality shall be in accordance with clause 4.2.16 for uplift, mean contact force and standard deviation for each of the pantographs. If the simulation results are acceptable, a site dynamic test with a representative section of the new overhead contact line shall be undertaken. For the above mentioned site test, one of the two types of the pantograph chosen for the simulation, shall be installed on a rolling stock that allows the appropriate speed on the representative section. The tests shall be performed at least for the worst case arrangements of the pantographs derived from the simulations and shall fulfil the requirements set out in clause 4.2.17. Each pantograph shall produce a mean contact force up to the envisaged design speed of the OCL under test as required by clause 4.2.15. In order to be acceptable, the measured current collection quality shall be in accordance with clause 4.2.16, for uplift, and either mean contact force and standard deviation or percentage of arcing. If all the above assessments are passed successfully, the tested overhead contact line design shall be considered to be compliant and may be used on lines where the characteristics of the design are compatible. The conformity assessment shall be carried out in accordance with EN50367:2006, Annex A.4.1. At the request of the applicant, the Notified Body carries out EC verification in accordance with Annex VI to the Directive 2008/57/EC, and in accordance with the provisions of the relevant modules. If the applicant demonstrates that tests or verifications of an energy subsystem have been successful for previous applications of a design in similar circumstances, the Notified Body shall take these tests and verifications into account for the EC verification. Assessment procedures for particular requirements for subsystem are set out in clause 6.2.4. The applicant shall draw up the EC declaration of verification for the energy subsystem in accordance with Article 18(1) of and Annex V to the Directive 2008/57/EC. In case of module SG, the Notified Body may take into account evidence of examinations, checking or tests that have been successfully performed, under comparable conditions by other bodies (4) or by (or on behalf of) the applicant. The module SH1 may be chosen only where the activities contributing to the proposed subsystem to be verified (design, manufacturing, assembling, installation) are subject to a quality management system for design, production, final product inspection and testing, approved and surveyed by a Notified Body. If the subsystem includes an innovative solution as defined in clause 4.1, the applicant shall state the deviation from the relevant clauses of the TSI and submit them to the Commission. In case of favourable opinion, the appropriate functional and interface specifications, and the assessment methods for this solution will be developed. The appropriate functional and interface specifications and the assessment methods so produced shall then be incorporated in the TSI by the revision process. By the notification of a decision of the Commission, taken in accordance with Article 29 of the Directive, the innovative solution may be permitted to be used before being incorporated into the TSI by the revision process. The assessment shall be carried out in accordance with EN50388:2005, clauses 14.4.1, 14.4.2 (simulation only) and 14.4.3. The assessment for AC power supply fixed installations shall be carried out according to EN50388:2005, clause 14.7.2. The assessment for DC power supply shall be carried out by a design review. The assessment shall be carried out for design and operation of substations in accordance with EN50388:2005 clause 14.6. The assessment, based on a compatibility study, shall be conducted according to EN50388:2005 clause 10.3 taking into account over-voltages given in EN 50388:2005 clause 10.4. If the overhead contact line to be installed on a new line is certificated as an Interoperability Constituent, measurements of the interaction parameters in accordance with EN50317:2002 shall be used to check the correct installation. These measurements shall be carried out with an Interoperability Constituent pantograph, exhibiting the mean contact force characteristics as required by clause 4.2.15 of this TSI for the envisaged design speed of the overhead contact line. The main goal of this test is to identify construction errors but not to assess the design in principle. The installed overhead contact line can be accepted if the measurement results comply with the requirements in clause 4.2.16 for uplift, and either mean contact force and standard deviation or percentage of arcing. The assessment shall be carried out by verifying the existence of the maintenance. The Notified Body is not responsible for assessing the suitability of the detailed requirements set out in the plan. the conformity of the subsystem has been checked against the requirements of Chapter 4 and in relation to Chapter 6.2. to 7 (except ‘Specific Cases’) of this TSI by the Notified Body. During the transition period as well as after the transition period has ended, until the subsystem is upgraded or renewed (taking into account the decision of Member State on application of TSIs), the interoperability constituents which do not hold an EC Declaration of conformity and/or suitability for use and of the same type are permitted to be used as maintenance related replacements (spare parts) for the subsystem, under the responsibility of the body responsible for maintenance. In any case the body responsible for maintenance must ensure that the components for maintenance related replacements are suitable for their applications, are used within their area of use, and enable interoperability to be achieved within the rail system while at the same time meeting the essential requirements. Such components must be traceable and certified in accordance with any national or international rule, or any code of practice widely acknowledged in the railway domain. The Member State shall specify for TEN lines those parts of the energy subsystem, which are required for interoperable services (e.g. overhead contact line over tracks, sidings, stations, marshalling yards) and therefore need to comply with this TSI. In specifying these elements the Member State shall consider the coherence of the system as a whole. The strategy described in this TSI applies to new, upgraded and renewed lines. Modification of existing lines to bring them into conformity with the TSIs may entail high investment costs and, consequently, can be progressive. In accordance with the conditions laid down in Article 20(1) of the Directive 2008/57/EC, the migration strategy indicates the way existing installations shall be adapted when it is economically justified to do so. any connection to railway line in neighbouring countries with an existing electrical power supply. The overhead contact line shall be designed for use by at least one of the pantographs with the head geometry (1 600 mm or 1 950 mm) specified in the CR LOC&PAS TSI clause 4.2.8.2.9.2. Whilst the TSI can be fully applied to new installations, implementation on existing lines may require modifications of existing equipment. The degree of necessary modification will depend on the extent of conformity of the existing equipment. The following principles apply in the case of the CR TSI, without prejudice to clause 7.5 (Specific cases). Where Article 20(2) of the Directive 2008/57/EC applies meaning that an authorisation of placing into service is required, the Member State decides which requirements of the TSI must be applied taking into account the migration strategy. Where Article 20(2) of the Directive 2008/57/EC does not apply because a new authorisation of placing into service is not required, the conformity with this TSI is recommended. Where it is not possible to achieve conformity, the contracting entity informs the Member State of the reason thereof. When the Member State requires placing new equipment into service, the Contracting Entity shall define the practical measures and different phases of the project which are necessary to achieve the required levels of performance. These project phases may include transition periods for placing equipment into service with reduced levels of performance. An existing subsystem may allow the circulation of TSI-conform vehicles whilst meeting the essential requirements of Directive 2008/57/EC. The infrastructure manager should be able in this case, on a voluntary basis, to complete the Register of Infrastructure set out in Article 35 of Directive 2008/57/EC. The procedure to be used for the demonstration of the level of compliance with the basic parameters of the TSI shall be defined in the specification of the Infrastructure Register to be adopted by the Commission in accordance with that Article. It is possible to gradually modify all or part of the Overhead Contact Line and/or the power supply system — element by element — over an extended period of time to achieve conformance with this TSI. However the conformity of the entire subsystem can only be declared when all elements have been brought into conformity with the TSI. The process of upgrading/renewal should take into consideration the need of maintaining compatibility with the existing energy subsystem and other subsystems. For a project including elements not being TSI conform, the procedures for the assessment of conformity and EC verification to be applied should be agreed with the Member State. While maintaining the energy subsystem, formal verifications and authorisations for placing into service are not required. However, maintenance replacements may be as far as reasonably practicable, be undertaken in accordance with the requirements of this TSI contributing to the development of interoperability. A subsystem in current operation may permit trains conforming to the requirements of the HS and CR rolling stock TSIs to operate whilst meeting the essential requirements. The Infrastructure Manager may in this case, on a voluntary basis, complete the Register of infrastructure in accordance with Annex C to this TSI to show the level of compliance with the basic parameters of this TSI. (b) ‘T’ cases: temporary cases, where it is recommended that the target system is reached by 2020 (an objective set in Decision No 1692/96/EC of the European Parliament and Council of 23 July 1996 on Community guidelines for the development of the trans-European transport network (5), as amended by Decision No 884/2004/EC of the European Parliament and of the Council (6). All the basic parameters from clause 4.2.3 to 4.2.20 are not applicable for lines with 1 520 mm track and they are an open point. may extend the values set out in EN50163:2004, clause 4 (Umax2 close to 2 000 V). Nominal contact wire height is 6,15 m, minimum 5,60 m and maximum 6,60 m.
All the basic parameters from clauses 4.2.3 to 4.2.20 are not applicable for lines with 1 520 mm track and they are an open point. For Slovenia for renewal and upgrade of existing lines with regard to existing gauge of the structures (tunnels, overpasses, bridges) the mechanical kinematic pantograph gauge is in accordance with the pantograph profile 1 450 mm as defined in standard EN 50367, 2006, figure B.2. In Great Britain, for upgrade or renewal of the existing energy subsystem, or the construction of new energy subsystems on existing infrastructure, the nominal contact wire height adopted shall not be less than 4 700 mm. In Great Britain, for new, upgraded or renewed energy subsystems the permissible lateral deviation of the contact wire in relation to the design track centre line under the action of cross — winds shall be 475 mm (unless a lower value is declared in the register of infrastructure) at a wire height of less than or equal to 4 700 mm including allowances for construction, temperature effects and mast deflection. For wire heights above 4 700 mm, this value shall decrease by 0,040 x (wire height (mm) – 4 700) mm. In Great Britain, for upgrade or renewal of the existing energy subsystem, or the construction of new energy subsystems on existing infrastructure, the mechanical kinematic pantograph gauge is defined in the diagram below (Figure 7.5.2.7). The diagram shows the extreme envelope within which movements of the pantograph head shall remain. The envelope shall be placed on the extreme position of track centre-lines permitted by track tolerances, which are not included. The envelope is an absolute gauge, not a Reference Profile subject to adjustments. W′ = 800 + J + (0,040 x (H – 4 300)) mm, when H > 4 300 mm. Height to top of envelope above rail level (in mm). The dimension is the sum of the contact wire height and the provision for uplift. 200 mm on straight track. 230 mm on curved track. 190 mm (minimum) where constrained by clearance to civil infrastructure that cannot be economically increased. Additional allowances shall be made including wear of contact wire, mechanical clearance, static or dynamic electrical clearance. Lines equipped with the electrification system operating at 600/750 V DC and utilising ground level top-contact conductor rails in a three and/or four rail configuration shall continue to be upgraded, renewed and extended where this is economically justified. National Standards shall apply. In the reference to EN50122-1:1997 clause 5.1, the special national condition to this clause (5.1.2.1) shall apply. This Annex indicates the conformity assessment of interoperability constituent (overhead contact line) of the energy subsystem. For existing interoperability constituents, the process described in Chapter 6.1.2. shall be followed. The characteristics of the interoperability constituent to be assessed applying modules CB or CH1 are marked by an X in Table A.1. The production phase shall be assessed within the subsystem. This Annex indicates the EC verification of the energy subsystem. The characteristics of the subsystem to be assessed in the different phases of design, installation and operation are marked by X in Table B.1. Verification as per clause 6.1.4.1 by validated simulation according to EN50318:2002 for design review. This Annex covers the information concerning the energy subsystem to be included in the Register of infrastructure for each homogeneous section of compliant lines which has to be established according to clause 4.8.2. Table C.1 contains those characteristics of the energy subsystem interoperability for which data are to be given for each line section. This Annex covers the information concerning the energy subsystem to be included in the European register of authorised types of vehicles. Table D.1 contains those characteristics of the energy subsystem interoperability for which data are to be given in the European register of authorised types of vehicles. to allow the free passage of the pantograph. This annex deals with the free passage of the pantograph (pantograph gauge). The electrical clearance is considered by the Infrastructure Manager. in collecting condition, the pantograph is in permanent contact with the contact wire and, for this reason, its height is variable. So is the height of the pantograph gauge. Mounting tolerance of the pantograph on the roof. Subscript a: refers to the outside of the curve. Subscript i: refers to the inside of the curve. non-insulated obstacles (earthed or at a potential different from the OCL) shall remain outside the mechanical and electrical gauges. Figure E.1 shows the pantograph mechanical gauges. The width of the pantograph gauge is mainly determined by the length and displacements of the pantograph under consideration. Beyond specific phenomena, phenomena similar to those of the obstacle gauge are found in the transverse displacements. the lower verification height h’u . Between those two heights, it can be considered that gauge width varies in a linear way. The various parameters are shown in figure E.2. The pantograph gauge width shall be determined by the sum of the parameters defined below. In the case of a line run by various pantographs, the maximum width should be considered. NOTE i/a = inside/outside curve. The half-length bw of the pantograph bow depends of the type of pantograph used. The pantograph profile(s) to be considered are defined in CR LOC&PAS TSI clause 4.2.8.2.9.2.
the height under consideration h’. For other track gauges the national rules apply. NOTE: Pantographs are normally mounted on the roof of a power unit, whose reference flexibility s0’ is generally smaller than that of the obstacle gauge s0. oscillations generated by track unevenness. The sum of the abovementioned allowances is covered by Σj. the raising of the pantograph head due to the pantograph head skew generated by the staggered contact point and the wear of the collector strip fws + fwa . The permissible value of fws is shown in CR LOC&PAS TSI and fwa . depends on maintenance requirements. bw,c – defined in clause 4.2.8.2.9.1 and 4.2.8.2.9.2 of CR LOC&PAS TSI. 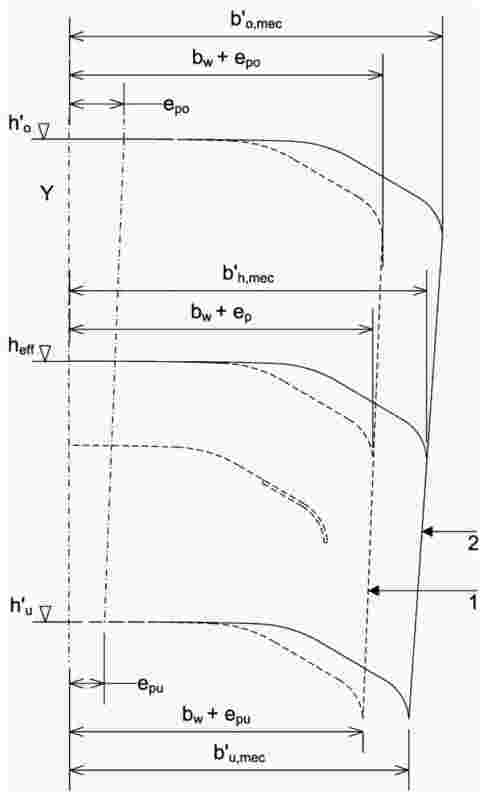 Phase separation section designs are described in EN50367:2006, Annex A.1.3 (long neutral section) and in Annex A.1.5 (split neutral section - the overlaps can be replaced by double section insulators) or described in the Figures F.1 or F.2. This small length ensures that the probability of a train stopping inside the phase separation does not require the adequate means to restart. The length of d shall be chosen in accordance with the system voltage, maximum line speed and the maximum pantograph width. The span covering three consecutive pantographs shall be greater than 80 m (L′′). The intermediate pantograph may be arranged at any position within this span. Depending on the minimum spacing between two adjacent operating pantographs the infrastructure manager shall state the maximum operating train speed. No electrical connection may exist between pantographs in service. This Annex deals only with inductive power factor and power consumption over the range of voltage from U min1 to U max1 defined in EN 50163. Table G.1 gives the total inductive power factor λ of a train. For the calculation of λ, only the fundamental of the voltage at pantograph is taken into account. For yards or depot, the power factor of the fundamental wave shall be ≥ 0,8 (NOTE 1) under the following conditions: the train is hotelling with traction power switched off and all auxiliaries running and the active power being drawn is greater than 200 kW. The calculation of overall average λ for a train journey, including the stops, is taken from the active energy WP (MWh) and reactive energy WQ (MVArh) given by a computer simulation of a train journey or metered on an actual train. In order to control the total power factor of the auxiliary load of a train during the coasting phases, the overall average λ (traction and auxiliaries) defined by simulation and/or measurement shall be higher than 0,85 over a complete timetable journey. (typical journey between two stations including commercial stops). applicable to trains in conformity with the HS TSI ‘rolling stock’. During regeneration, inductive power factor is allowed to decrease freely in order to keep voltage within limits. NOTE 1: Higher power factors than 0,8 will result in better economic performance due to a reduced requirement for fixed equipment provision. NOTE 2: on line categories III to VII, for rolling stock existing before publication of this TSI, the Infrastructure Manager may impose conditions e.g. economic, operating, power limitation for acceptance of interoperable trains having power factors below the value specified in Table G.1. New and modernised traction units should be equipped with high speed circuit breakers capable of breaking the maximum short-circuit current in the shortest possible time. Maximum speed measured in kilometres per hour for which a line has been designed. (1) OJ L 399, 30.12.1989, p. 18. (2) i.e. pantographs certificated as Interoperability Constituent according to CR or HS TSIs. (3) i.e. the speed of the two types of pantograph shall be at least equal to the design speed of the simulated overhead contact line. (4) The conditions to trust checking and tests must be similar to the conditions respected by a Notified Body to subcontract activities (see §6.5 of the Blue Guide on the New Approach). (5) OJ L 228, 9.9.1996, p. 1. (6) OJ L 167, 30.4.2004, p. 1. (8) The tripping of the circuit breaker should be very rapid for high short-circuits currents. As far as possible, the traction unit circuit breaker should trip in order to try to avoid the substation circuit breaker tripping. (9) If breaking capacity of the circuit breaker allows it, then tripping shall be immediate. Then, as far as possible, the traction unit circuit breaker should trip in order to try to avoid the substation circuit breaker tripping.